Tokyo, June 10, 2008: Japan Airlines (JAL) will start introducing on US routes a luxurious new suite to JAL First Class and a leading-edge seat to JAL Executive Class Seasons, the airline’s branded business class. 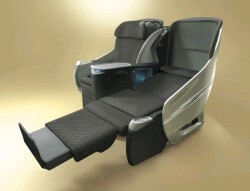 The airline will launch the JAL Suite in first class and the JAL Shell Flat Neo Seat in business class when the airline introduces new 777-300ER aircraft on US routes, starting with the Tokyo - New York route on August 1, 2008. Brand new 777-300ER aircraft fitted with both the new suite and new seat will start operating every other day on the Tokyo-New York route (JL005/ 006) on August 1, 2008, going daily on August 11. This will be followed by the Tokyo-San Francisco route on September 13, 2008, and the Tokyo - Chicago and Los Angeles routes in FY2009, the year starting April 1, 2009. The popular JAL Premium Economy service with the innovatively designed JAL Sky Shell Seat, plus the airline’s very latest economy class seats will also be introduced on these aircraft at the same time. Passengers travelling on these US routes will, therefore, be able to experience, in all classes of travel, the very best seating and service available in the skies today. The JAL Suite in JAL First Class offers one of the largest and most luxurious personal spaces in the sky complemented by an unparalleled in-flight service experience for the ultimate in privacy, relaxation, dining, and entertainment. 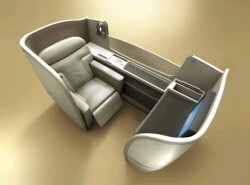 The JAL Suites are 20% more spacious than the airline’s current seat in first class, the JAL New Skysleeper Solo Seat. The exclusive compartment of the JAL Suite is made of a range of the latest composite materials which provide a wonderfully sophisticated finish. 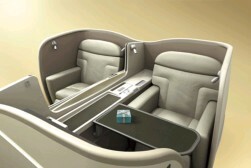 Only 8 suites are available in the JAL First Class cabin set in a 1-2-1 configuration. The JAL Suite features a seat upholstered in pale gray leather with 5-inch wide, thickly padded armrests making it reminiscent of a traditional armchair. At the touch of a button, the armrests smoothly retract as the seat converts into a full-flat bed. In the 180° position the seat combines with an ottoman located at the opposite end of the compartment to create one of the largest and widest, most comfortable sleeping areas in first class. When the seat is in the upright position, the ottoman can be used as a seat, should the passenger, for example, choose to discuss business, dine or just pass the time with a fellow traveler. The large sliding table can be placed conveniently in between the seat and ottoman providing ample space for both passengers at such times. Passengers, seated in the pair of suites located in the centre of each row, can raise or lower privacy partitions located between them to create the exact atmosphere they wish. Passengers are provided with Bose noise-cancelling headphones and on their own personal 19-inch personal TV screen can enjoy the latest movies, music and games using JAL's state-of-the-art audio-visual-on-demand (AVOD) in-flight entertainment system. When dining onboard, passengers in the JAL Suite can now order whatever they like, whenever the like, as often as they like. In the JAL Suite, no meal times will be fixed to give passengers the full freedom to choose when they what to eat. With the assistance of a cabin attendant at the beginning of their journey, passengers are able to tailor their dining schedule specifically to their own needs. Furthermore, all items on the full-course menus and a la carte menu can be mixed and matched according to each passenger’s individual taste. Japan Airlines offers first class passengers a choice of Japanese or Western full-course menus. Passengers choosing the Western menu can select from three entrees, one of which is a JAL Healthy Menu Selection. In the JAL Suite, it will be possible for the more health-conscious passenger to order the main dishes of the western full-course without the sauces that normally accompany them. Alternatively passengers can savor the seasonally changing flavors of a traditional Kyoto-style menu known as kaiseki-ryori. For JAL Suite passengers, six tasty new appetizers called kobachi will be served just before the main elements of this meal. The appetizers will be served on small bone china dishes arranged in a traditional two-tiered bento (lunch) box. The first kobachi to be served onboard is inspired by the beautiful colored autumnal leaves of Rakusei, in the western part of Kyoto, and includes such delicious seasonal tastes as Japanese conger eel and ayu (sweetfish) with its roe. The a la carte menu, which contains about a dozen dishes, has been enhanced by adding a simple, low calorie, healthy vegetarian option, known as shojin ryori in Japanese, which is commonly served in Zen Buddhist temples. New tableware enhances the whole JAL Suite dining experience. A number of items have been created by master craftspeople of Japan such as beautiful chopsticks made from the Aomori hiba, a Japanese cypress tree, and unique porcelain mugs from Hasami, Nagasaki which have exclusively been designed and made for JAL. The concept of universal has been incorporated in these items making them easier to grip and use. Mattresses have been made exclusively for the JAL Suite by the company Tempur-Pedic International Inc., whose products have been recognized by NASA and certified by the Space Foundation. The mattresses are made of a material called TEMPUR® described by the company as ‘a visco-elastic temperature sensitive material that moulds to your body. It yields slowly under compression, making no counter pressure, until the load is distributed on the entire area. When the load is removed, TEMPUR recovers slowly.’ The mattresses provide unrivalled support and the ultimate sleeping experience. Cabin attendants place a mattress on each seat-bed on the passenger’s request together with a down comforter and a choice of pillow. Passengers can choose between a Symphony Pillow made of super soft TEMPUR, or a down pillow. New loungewear is also offered in the JAL Suite. A cardigan embossed with a gold-colored JAL First Class logo and matching pants made of 100% pure cotton have been exclusively designed for JAL by the designer Aoshi Kudo. The JAL Shell Flat Neo Seat has been created based on the design of JAL Shell Flat Seat - JAL's award-winning seat in business class. The new seat for JAL Executive Class Seasons has been improved in a number of ways to maximize business class passengers’ comfort and relaxation. Compared to the JAL Shell Flat Seat, the JAL Shell Flat Neo Seat reclines further to an angle of 171 degrees and its seat pitch and width have both been increased. The upholstery of the seat, which now includes a slip-proof cover, has been enhanced to ensure that passengers can relax to the full and enjoy the most refreshing of sleeps. The controls of the seat have been refined to enable passengers to find the perfect position in which to relax. A 15.4 inch personal TV screen has been incorporated into the JAL Shell Flat Neo Seat providing passengers with one of the world’s largest screens available in international business class. By expanding the center console of the seat, stowage areas have been increased, freeing up even more space for the passenger. Three handy locations for spectacles, slippers and a water bottle have been incorporated into the new design and the magazine rack has been enlarged. 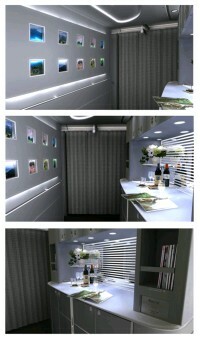 A new feature of JAL Executive Class Season and a world first will be the “Sky Gallery”. One of the walls of the business class cabin will feature a photographic exhibition that will be regularly changed over the year. The first exhibit, in collaboration with Fuji Film, will be a series of photographs of forests in Japan entitled ‘Forest Forever’. The gallery will be located directly opposite a self-service bar counter, where passengers can enjoy snacks and beverages at anytime, whilst admiring the photographs. Offering the ultimate in in-flight comfort, JAL Premium Economy is located in its own exclusive cabin area and features the new JAL Sky Shell Seat, the world's first shell-shaped seat in premium economy class with 20% more legroom than JAL’s economy class seats. The clever shell-shaped sliding seat-back design of the JAL Sky Shell Seat will ensure that passengers' private space is maintained throughout the flight, undisturbed even when the seat in front is reclined. For added comfort, this ergonomically designed seat comes fitted with a footrest and headrest. Every seat has its own power outlet suitable for personal computers, and a seat tray that can easily accommodate a fully opened A-4 sized laptop. Amenities provided in JAL Premium Economy are the same as those supplied in business class. JAL Premium Economy was first introduced on JAL international routes in December 2007. It will be the first time for this service to appear on US routes. 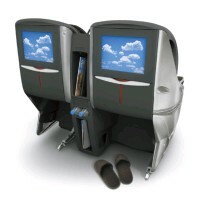 JAL’s latest economy class seat with a 9inch personal TV screen will be fitted on board. The seats used on these US routes have been slightly modified with a headrest called a ‘Hammock Headrest’, which has added cushioning for extra comfort. JAL’s state-of-the-art audio-visual-on-demand (AVOD) in-flight entertainment system (MAGIC III version) will be available on board in all classes of travel on these routes offering passengers a selection of 132 movie, music, video and game channels. AVOD gives passengers the freedom to start, stop, fast forward or rewind programs of their choice. The more environment-friendly 777-300ER features improved fuel consumption which is 20% lower than the 747-400s currently being operated on these routes, enabling JAL to reduce its overall CO2 emissions by a similar percentage. The customer-friendly principles of Universal Design have been incorporated into all of the seats’ designs to ensure that they are usable by as many people as possible regardless of age or physical condition. The JAL Group is Asia’s biggest airline group in terms of sales revenues and passengers carried annually. JAL Group airlines serve 214 airports in 33 countries and territories, including 60 airports in Japan. The international network covers over 240 passenger routes and 37 cargo routes, and the domestic network covers 156 routes. JAL and its seven subsidiary airlines make a total of up to 1,200 domestic and international routes passenger flights a day. With around 23,000 employees in the air transport segment, JAL Group operates a fleet of some 270 aircraft including Boeing 747s and B777s and is now in the process of a major fleet renewal, introducing more fuel-efficient small and medium aircraft such as the B737 New Generation series and in the future the new high-tech Boeing 787 Dreamliner. Top quality in-flight service has always been the hallmark of JAL’s reputation. Cuisine offered in all classes is a combination of Western and Asian food. JAL carries a fine selection of award-winning wines and sake in JAL First Class and JAL Executive Class - Seasons, JAL’s business class. A member of the oneworld global alliance from April 2007, JAL offers customers many benefits, such as the JAL Mileage Bank frequent flier program.